Home schooling and fencing. Do they have anything in common? Do they strike a similar cord? Iguess I first need to explain why I home school? Everyone seems to home school for a different reason. But I guess I home school because I have a different standard for education than any organized school that I have available to me. I expect more from education than public schools, or even private schools, seem to offer. What is this ¡§more¡¨ that I expect? I guess it is basically, the big picture, that I feel is lacking from organized, mass-produced education. It is providing my children with the tools, the more or less, classical tools, to succeed in whatever they choose to pursue in life. And I believe that fencing does fit into this classical notion of education. I have never fenced and knew very little about it before I got my children into fencing. What I knew is that it was a very disciplined art, it has a real place in history, and it has been put (sometimes beautifully) in historical movies. My sisters had taken fencing years ago and had really enjoyed it. 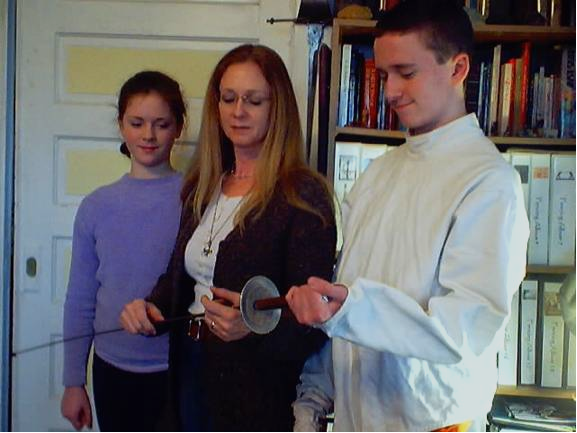 When my children were very young I read in our local paper about a fencing instructor at The University. I made a mental note to myself to check this out in about 15 years, when my kids were in high school. In the meanwhile I searched out fencing or sword fighting scenes in movies. For example, we compared the various ways movies deal with the final Hamlet duel. Princess Bride had a wonderful right/left handed fencing scene. Some of the King Arthur movies had fun combat/sword play scenes to show kids. But, before my kids were high school age, I learned that young children were taking fencing lessons from the university instructor and I was thrilled when he would take us and teach my two at the same time. They were about 10 and 12 at the time. They did as their mother commanded: They took fencing lessons. I didn't ask them if they liked the lessons or not, because they were going to taking them regardless. But I could tell that it was OK when they wanted to show off their skills to every visitor that came to our house! A) Think and plan ahead. They need to plan their next move, and plan it quickly. B) Be flexible. They need to be able to change that plan when the external situation (their opponent) changes tactics. C) Read your opponent. They should try to anticipate their opponent¡¦s next move. Through trial and error they prove their theories and improve their future plans and tactics. D) Learn control. Don¡¦t let a momentary disappointment ruin the long term goal, or a moment of success make you lose your concentration. E) Don¡¦t become complacent. Don¡¦t become too pleased with yourself so that you let down your guard. F) Don¡¦t become predictable. Try to mix things up enough so their opponent can¡¦t read them easily. G) Don¡¦t loose your concentration. Stay alert at all times. Don¡¦t get lulled into robot-like responses. H) Don¡¦t cheat or try to bend the rules. Self explanatory! I) Use all the weapons in your arsenal ¡X all the things you have learned. So, therefore, it is important to learn as much as you can so your arsenal is full of a variety of ideas and tactics. I look at all of these lessons and they seem familiar. Doesn¡¦t Sun Tzu discuss ideas likes these in The Art of War? Don¡¦t business people use this book as a guide to business strategies? Could fencing be teaching some very basic principals that are fundamental to a successful business life? These are lessons that wise men have been trying to teach us for millennia. A) ¡§True excellence is to plan secretly, to move surreptitiously, to foil the enemy¡¦s intentions and balk his schemes . . . ƒp This sounds like fencing ¡X and it sounds like life in the business world. B) ¡§In all fighting [read: striving], the direct method may be used for joining battle, but indirect methods will be needed in order to secure victory.¡¨ This too is fencing. This too is life. So often it is the little things, the seemingly unimportant things that can make the difference between success and failure. C) ¡§Though the enemy be stronger . . . scheme so as to discover his plans and the likelihood of their success. Rouse him, and learn the principle of his activity or inactivity. Force him to reveal himself, so as to find out his vulnerable spots.¡¨ This seems absolutely like fencing. It doesn¡¦t really sound like something a modern mother wants her children to learn, but doesn¡¦t this reflect the ¡§real¡¨ world? The business world? D) ¡§Therefore, just as water retains no constant shape, so in warfare [read LIFE] there are not constant conditions . . . He who can modify his tactics in relation to his opponent, and thereby succeed in winning, may be called a heaven-born captain.¡¨ Modify your tactics!! Yes!! How many people do I know that have not been able to modify their tactics and then they fail?! E) ¡§Disciplined and calm . . . this is the art of retaining self-possession.¡¨ This, too, is a good lesson for fencing and life ¡X all of life. I feel this is one of those underpinnings that all else can be built upon. A mother doesn¡¦t really want to think that she is training her children for war or even some type of combat (especially her daughter! ), but so many of these lessons seem ideally applicable to life in general, whether it¡¦s deciding a career path, doing financial planning, or determining the best treatment for a patient. You need all of these lessons: planning, flexibility, being able to read the situation, self-control, constant vigilance, ethical conduct, and a reliance on your own preparedness. So, yes, fencing does fit into my big picture of providing solid principles and a full arsenal of time-proven tactics for my children as they head out to face the challenges in their future.